Hot Water Beach is located along New Zealand's Pacific coast just south of Mercury Bay at the northeast tip of the Coromandel Peninsula. The short answer is: The hot water spring are exposed ONE hour either side of low tide (okay, up to two hours but only if the low tide is REALLY low). A table of low tides is displayed to the right. The low tide table starts TODAY (as defined on our server) and provides two weeks of low tides so you can plan your visit to Hot Water Beach. If you're not interested in the next two weeks, update the day, month and year and you'll see the low tides from that date -- within the range from 1 Aug 2003 to 31 Dec 2020. NOW you can plan your visit to Mercury Bay -- and Hot Water Beach! Access -- plan on walking through the small stream which separates the parking lot from the 100 m of beach you need to cross (sorry, there is NO mobility impaired access). If you're planning on staying at Hot Water Beach, be advised that there is NO camping on the beach. CAUTION: Despite the volunteer lifeguards, Hot Water Beach's rip tides that have claimed several unwary visitors. Know how to swim in rip tides before you venture into the ocean! 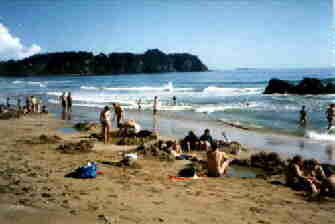 World famous Hot Water Beach is located south of Whitianga, north of Tairua and only a few kms from Hahei. Driving, there's only one way to get to Hot Water Beach. Take State Highway 25 to Whenuakite where the only notable junction is the road to Hot Water Beach, Cook's Beach and Hahei/Cathedral Cove. Stay on the main road until you see the (right) turn to Hot Water Beach (~8 km). Please pay attention to the speed limit on this road as it gives a good indication of the road condition -- which is paved right up to the car park.